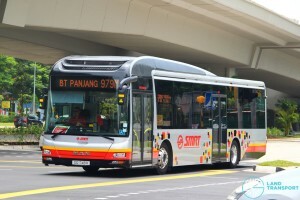 SMRT Bus Service 979M was a trunk service plying from Bukit Panjang and looping at Choa Chu Kang North 5 within the Yew Tee estate. It passed through Woodlands Road, Choa Chu Kang Drive, and Choa Chu Kang North 6. Introduced on 24 April 2016 on a temporary basis, the route offered a direct connection between Bukit Panjang and Choa Chu Kang North 5, while road widening works at Stagmont Ring were still in progress. This was the first temporary route launched under the Bus Service Enhancement Programme (BSEP). Bus Service 979M was integrated into the amended Bus Service 979 and withdrawn on 22 July 2018. 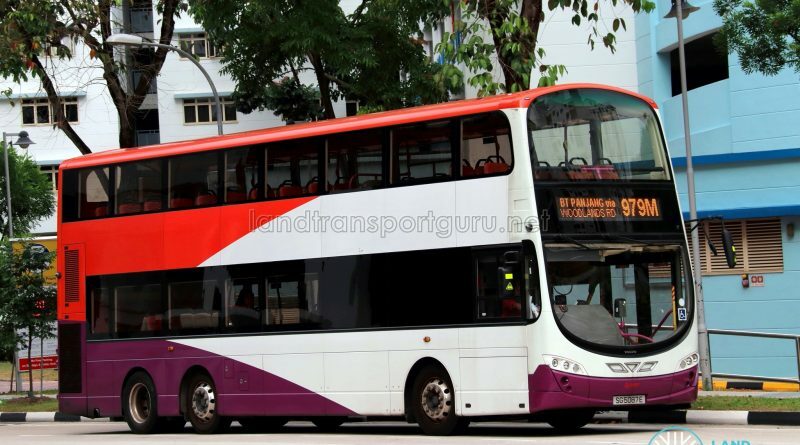 Bus Service 979M was a residential trunk route serving within the housing estates at Stagmont, connecting housing blocks along Choa Chu Kang North 5 and 6 with connections to key transport nodes at Bukit Panjang MRT / LRT. It duplicates SMRT Intratown Service 307 along Choa Chu Kang North 5 and 6. Bus Service 979 was originally planned to serve Choa Chu Kang North 5 before continuing its route to Yew Tee MRT Station from Bukit Panjang. 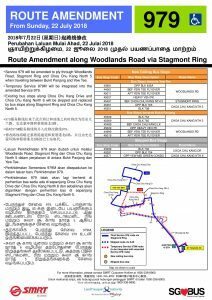 However, due to the restrictions at the junction of Stagmont Ring and Woodlands Rd, Bus Service 979 was launched in tandem with the opening of the Downtown Line Stage 2 on 27 Dec 2015 and plied KJE instead of Stagmont Ring. 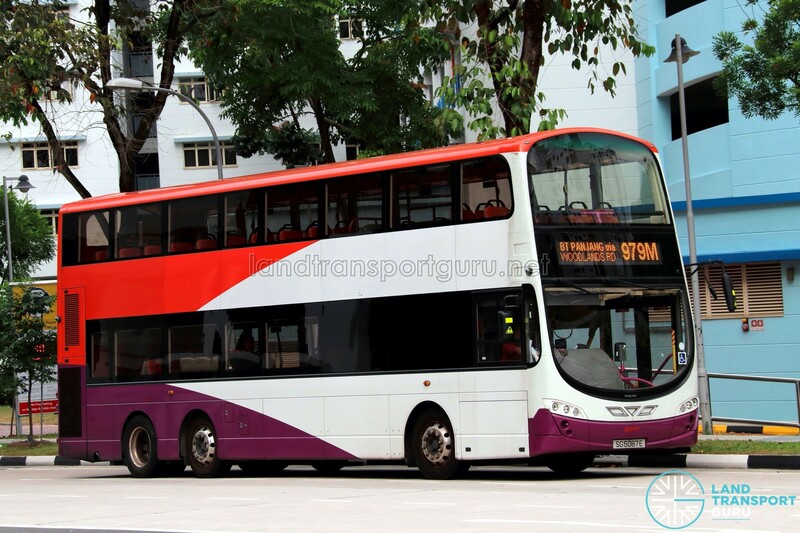 Hence, Bus Service 979M, introduced on a temporary basis, serves as an interim direct link for Choa Chu Kang North 5 residents to Bukit Panjang MRT Station, albeit the Downtown Line station already operating for 4 months at launch date. 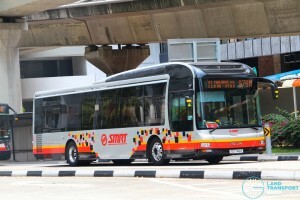 It is the first temporary bus route to be introduced under the Bus Service Enhancement Programme (BSEP). The junction works at Stagmont Ring and Woodlands Road were completed on 1 July 2018. With the amendment of Bus Service 979 to serve Choa Chu Kang North 5 via Stagmont Ring on 22 July 2018, Bus Service 979M was withdrawn. Fares: Charges fares for regular trunk services. See Bus Fares for exact fares. 2016 (24 Apr): Introduced under the LTA’s Bus Service Enhancement Programme (BSEP) as a temporary service, plying from Bukit Panjang and looping at Choa Chu Kang North 5. Wheelchair accessible at launch. 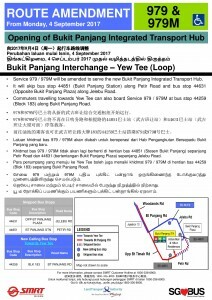 2017 (04 Sep): Amended to Bukit Panjang ITH. 2018 (22 Jul): Integrated with Service 979 and withdrawn. 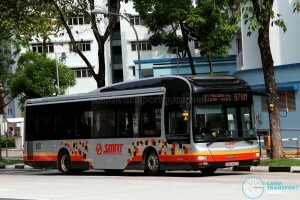 Should have more frequent bus 979..esp morning rush hour.It takes 20-25 mins to bukit Panjang downtown line…Omg! There is convenience to me,thank you. Hi.. I wondering why only it does to have only 2 or 1 double deck buses. Why not few? As it is quite many passenger in this bus not only in peak hours. why 979m dont stop at blk 634? 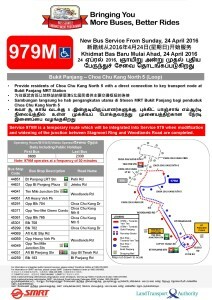 Bus Service 979M does not stop at Block 634, CCK North 6 as Bus Service 979 will not stop there also once the Stagmont Ring works are complete. If 979M were to stop there, residents will lose out the direct link to Bukit Panjang when 979 is amended and 979M is withdrawn. then y stop @ nursing home (opp yew mei grn condo)? stagmont ring seem 2 be aft the stop?